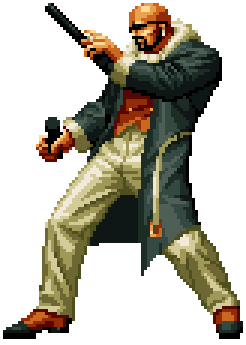 Mr. Big (Romanji: ミスター・ビッグ or Mr. ビッグ) is the (canonwise) 'real' villain of the original Art of Fighting and the man responsible for the kidnapping of Ryo Sakazaki's sister Yuri. Although he works as the right-hand man for Southtowns kingpin of crime Geese Howard, he is constantly looking for ways to improve his position and dethrone him. When the 1996 King of Fighters tournament was announced, Geese Howard brought his right-hand man Mr. Big and his half-brother Wolfgang Krauser to form the famous Boss Team. This team consisted of the bosses of the Art of Fighting and Fatal Fury series, and thereby represented one of the (canonwise) most overpowered teams in the KOF history. This page was last edited on 10 February 2018, at 16:38.